Especially in the early stages of an auto loan, it's not uncommon for borrowers to owe more money on their loans than their vehicles are worth. Vehicle values depreciate rapidly in the first few months of ownership, which sets the stage for an upside-down loan situation, or one in which the outstanding balance of the car loan is larger than its cash value. In these situations, if you were to experience a total loss on the vehicle, the settlement your insurer would provide would fall short of what you would need to repay your auto loan. That's when gap insurance coverage can help. 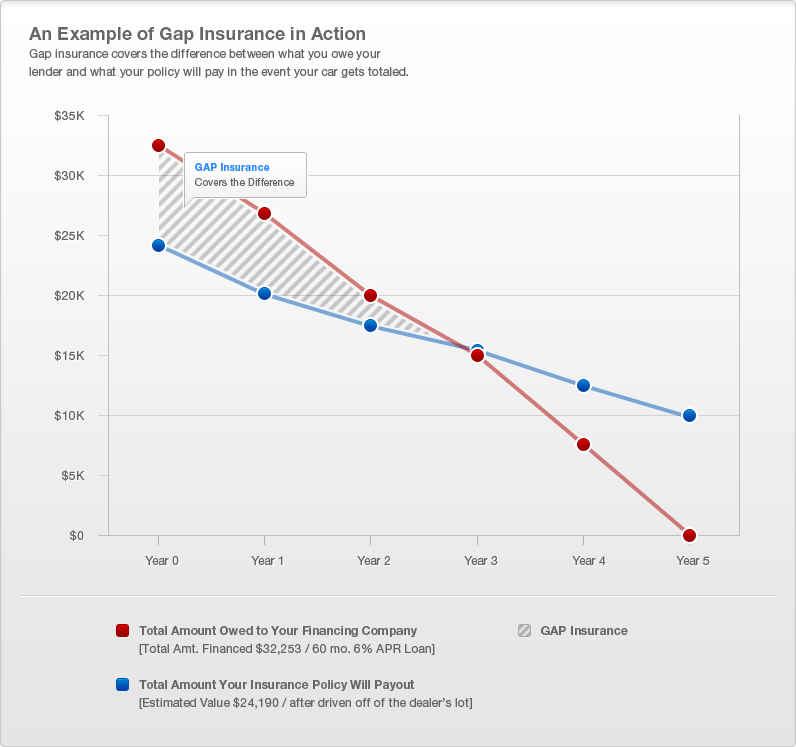 Gap insurance is a special form of auto insurance that "closes the gap" between a car's cash value and the remaining balance on the car loan in the event the vehicle is totaled. When a total loss occurs, gap insurance providers will pay the difference between the insurance settlement and the amount of the loan, and most will also pay the driver's insurance deductible. Some financing companies may require the coverage of borrowers who will be upside down in their loans and of those who lease their vehicles. Typically, drivers carry gap insurance coverage for a relatively short period of time, as it is only necessary while they are upside down in their loans. The best way to understand an abstract concept like gap insurance coverage is to review a concrete example with hypothetical numbers. Say you choose a car that costs $25,000, make a $1,000 down payment, and finance the remaining balance at zero-percent interest for five years. At the same time, you purchase physical damage auto coverage with a $500 and a gap insurance policy. While you are still upside down in the loan, you have an accident, totaling the vehicle. When you submit your claim to your auto insurer, the adjuster determines that your vehicle is only worth $22,000, and you owe $23,500 on your auto loan. You would accept the $21,500 settlement from your insurer (the vehicle's value less your $500 deductible) and combine it with the benefits from your gap insurance policy. Gap insurance would pay the $1,500 difference between the value and the loan balance plus your deductible for a total benefit of $2,000, thereby completely closing the gap between your $23,500 loan balance and your $21,500 insurance settlement.